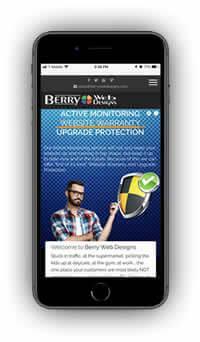 Design - Berry Web Designs Designs Custom Mobile Websites at Affordable Flat-Fee Rates. At the gym, in the supermarket, at work or on the go. These are all places your customers are searching for you: Everywhere except sitting at home in front of their computer. With over 85% of internet searches being done by smart phone users, it's safe to say that your customers are likely to be anywhere while they are searching for your products and services: anywhere except sitting in front of their computer at home. That being said, recent research indicates that the majority of visitors won't return to your website after having a poor experience while browsing using their mobile device. Everyone knows that smart phones are growing at an exponential rate. In the US alone, smart phone penetration has reached 40% of all mobile phones, and growing fast while 70% of mobile searches lead to online action within an hour. Mobile users that find your business online are 3 times more likely to buy than the same search done on a desktop or laptop. Why? Mobile users are on the go. When you’re browsing, you grab the laptop and start researching or just satisfying curiosity for products or services. When you grab your smartphone to search, you have a specific intent in mind, whether it be food, clothing or an oil change for your car. Mobile searchers are buyers, assuming you can meet their needs. We design and develop custom mobile websites that enable your customers to have the optimal user experience on all devices. We can design websites that are liquid and easy-to-use on all devices. When it comes to websites we've found that its all about the user experience. We provide a clean, clear website that's uncluttered and easily navigated to enable your customers to find what they're looking for with ease. In March of 2018, Google announced that they would no longer use the desktop version of websites for indexing. In the past, some websites delivered one set of content on the desktop, and another sometimes wildly different set of content for mobile devices. That often caused issues for website visitors. Since Google doesn't have a separate index for mobile, and another one for desktop, this change is very significant. At Berry Web Designs, we are mindful of these changes and work diligently to incorporate the latest design trends and considerations into our work. We provide basic hosting free for the first 90 days. Thereafter, for a nominal monthly fee. You are also welcome to provide your own hosting after final payment. The old addage "a picture is worth a thousand words" has never been more true. We provide responsive galleries which will allow you to showcase your work beautifully. A basic contact form to allow your visitors to contact you for information. We always include an auto-responder to inform your visitor of the information collected and to insure it was received. Lets face it, the content on your website won't change terribly often, and when it does, unless you do web design, it could be a challenge. We've got you covered with free basic updates*. The backbone of everything we do is a world class CMS which is responsible for in excess of 30 million websites globally. Constant development results in superior performance and availability. We do not outsource any of our work, including service and support, to any other country. You will be able to speak to someone in the USA before, during and after the sale. At Berry Web Designs, we understand you'll want value for your dollar. All of our services are available at individual pricing to allow you to select only those services that best fit your needs. Occasionally you may need more than basic changes. We provide an innovative "Time Bank" which allows you to pre-purchase in 20, 40 or 80 hour increments. Non-expiring. Qualtity discounts apply. * Includes provided text and photo changes only. More complex changes may require additional fees.